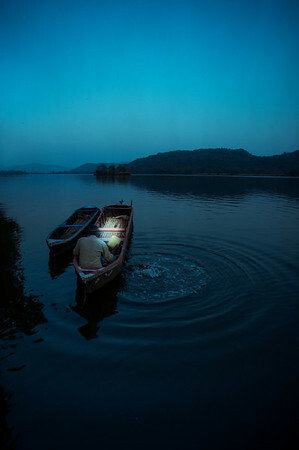 Its dark and silent...with the sort of stillness that you can experience only when you are far far away from the city. You hear the sounds of nocturnal creatures from the forests around you and it will be quite some time before the sun comes up. The old boatman pushes off into the crocodile infested river with a small torch..he doesn't really need it..he's been navigating his way through these waters longer than he can remember...I can see him disappearing into the mist and I get up from the jetty and start taking pics as the forest wakes up...the thwap of the shutter the only sound that's out of place.